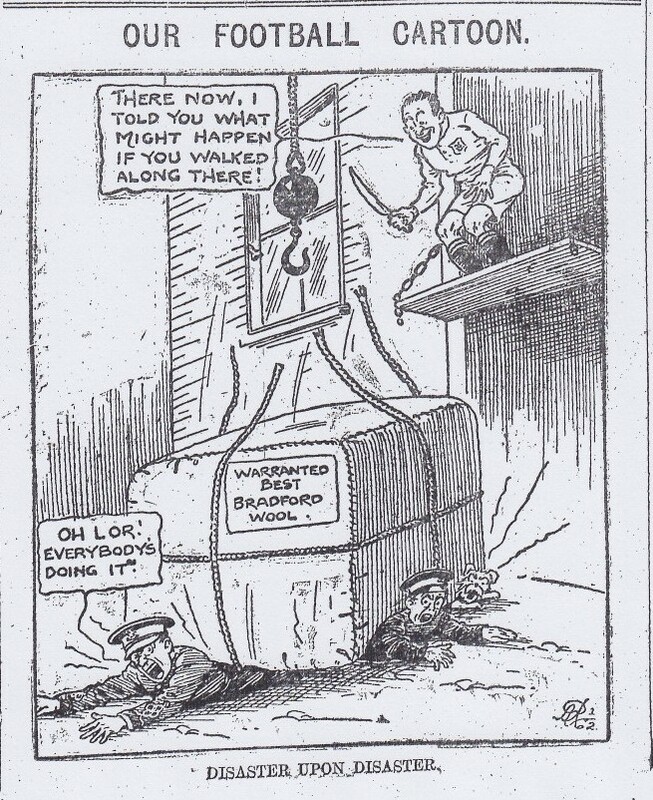 Woolwich Arsenal travelled to Bradford 100 years ago this week. Angus McKinnon and David Greenaway returned to the team after one game whilst Ernest Hanks made his League debut in place of McLaughlan, who had picked up an injury in training. In addition to McLaughlan, Lewis and Common were also on the injured list. 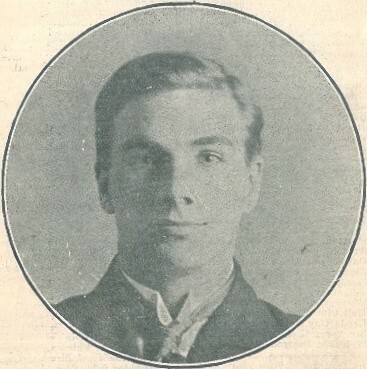 Harold Walden had been Bradford’s top scorer in 1911/12 and went on to join Arsenal in 1920. The conditions were not the best to play top level football. Continuous rain before and during the game had turned the pitch into a quagmire and fog didn’t help either. This resulted in a crowd of 7,000 turning up to the game – less than half Bradford’s average home gate. Arsenal kicked-off and immediately set out to attack the home team’s goal. Randall had a shot blocked by a defender whilst another shot went wide, along with shots from Greenaway and McKinnon. From the resulting goal kick from the last wayward shot Ewart put the ball into Arsenal’s half which Spiers latched onto and, following good interplay between Walden and Fox, Peart was forced to concede a corner. Peart attempted to clear Bond’s corner but only succeeded in returning to the Bradford winger who put his second attempt into the Arsenal penalty area and Spiers headed home. Crawford was then called upon twice to keep Bradford from further increasing their lead with the forwards running Shaw and Peart ragged. Bradford eventually broke down the Arsenal defence with Walden putting the ball out wide to Logan who then put Spiers through. Spiers centred to Walden who made no mistake. Arsenal kept plugging away with Randall looking most likely to score. With five minutes until the interval Macdonald mis-kicked a clearance and let in Hanks who justified his inclusion in the team and gave Ewart no chance. The teams swapped ends with the score Bradford City 2 Woolwich Arsenal 1. The second-half started with Arsenal once again on the attack. Flanagan summed up Arsenal’s dreadful luck that had plagued them throughout the season by smashing a shot against the crossbar. The state of the pitch also robbed Hanks of an almost certain goal as, when running through, he slipped in the mud and fell over. Even worse was to come when a speculative shot by Spiers took a deflection off Peart which left Crawford with no hope and the home team restored their two goal lead. Ewart pulled off a fine save to deny Flanagan and a melee in the Bradford goalmouth failed to produce a goal. Half-chances fell to both teams but the score remained Bradford City 3 Woolwich Arsenal 1. The general consensus was that Arsenal had been unlucky to come away without at least a point. Woolwich Arsenal stayed in 18th position above Tottenham and Notts County. However, they would need to improve as form of three consecutive defeats, and two points in five games would not keep them in the First Division. Following his first team outing the previous week McEachrane came in for Graham. In a much re-shuffled team Madge, Payne and Ansell replaced Calder, Robertson and Hanks (who had been called into the first team). Ansell was another local player being given a trial. The reserves really went to town, putting six goals past the Bees. It was noted that Common and McLaughlan were in the stand, hopefully they were taking notes from the youngsters on how to find the back of the net. As it was up North, the weather was equally foul in South East London with the rain falling throughout the game. It took just three minutes for Payne to open the scoring with a tap in after the Brentford keeper could not hold Burrell’s shot. Within a couple of minutes the Reds were two up from a Spittle header. Spittle scored his second after 13 minutes with another header, just beating the keeper to the ball. Brentford pulled a goal back after 35 minutes when Dolby hit a cross shot that went in off the post. Spittle completed his hat-trick shortly after this with a fine solo effort. The fans were struggling to keep track of the score by now. In the dying seconds of the first-half Madge scored with a header to make the score Woolwich Arsenal reserves 5 Brentford reserves 1. The second-half was just as exciting but without as many goals. 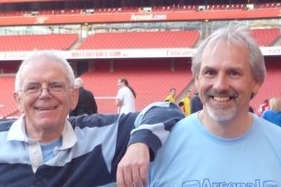 The fans in the West Stand, however, were anticipating plenty of goals as they “enlivened the proceedings with innumerable repetitions of “Everybody’s Doing It.”” Ansell scored Arsenal’s sixth and final goal with an oblique shot. Brentford scored a final consolation goal shortly after but, in attempting to keep the shot out, Wilson and Ford collided, knocking each other out. Spittle almost scored another when he hit the bar with an open goal at his mercy. The final score was Woolwich Arsenal reserves 6 Brentford reserves 2. This maintained the reserves 100% home record. Following their walloping of Brentford the reserves next game was only two days later. This time they were at home to Portsmouth’s reserve team. There were four changes to the team but the team was swapped around so that only four players retained their position from Saturday. This game wasn’t quite as exciting as the Brentford game, with both sets of forwards being constantly caught offside. It took 30 minutes for the first goal to be scored, Graham putting the Reds ahead with a crashing shot – this being the only goal in the opening 45 minutes. Portsmouth equalised after 55 minutes. Graham almost restored the lead but hit the bar. This proved costly as Portsmouth went ahead after 75 minutes with a high cross shot. Spittle equalised in the dying minutes of the game. Although the reserves had lost their 100% home record, they remained unbeaten at the Manor Ground. A win and a draw put them into second place in the South Eastern League table, two points behind Chelsea but with two games in hand. Following last week’s revelation that the Arsenal directors had bought land in Harringay the local press were very quiet. Maybe it was just a speculative story from Fleet Street. The London FA took action against the two Woolwich Arsenal players that had also been playing Sunday football. Freddie Groves was suspended for a month and Robert Evans was suspended for two months. Although neither were first team players, the squad depth was weakened by the two suspensions. Woolwich Arsenal were exonerated from all blame.